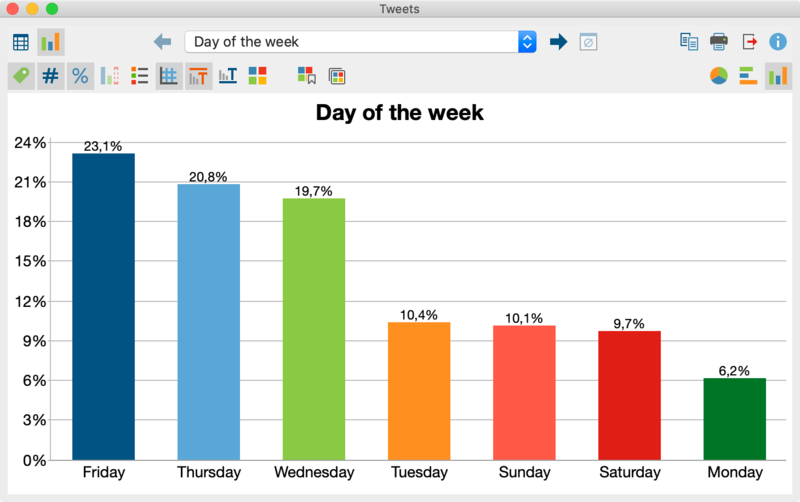 The analysis of tweets based on coded segments can reach its limits if you want to analyze thousands of tweets. It’s hard to keep an overview of the whole picture, simple automatic coding reaches its limits and manual codings are practically impossible. Analysis functions are needed that enable you to keep track of larger amounts of data and to make targeted comparisons between authors, etc. For this purpose, MAXQDA offers a special analysis view for imported twitter data, with which you can evaluabte tweets according to numerous criteria, such as: contained words, hashtags, authors, countries and/or sources. A prerequisite for using the Twitter analysis functions in MAXQDA is that you have already imported Twitter data into your MAXQDA project. You can recognize imported Twitter data in the “Document System” by their Twitter symbol. Twitter data imported with MAXQDA version 12 cannot be used for the analysis described below. 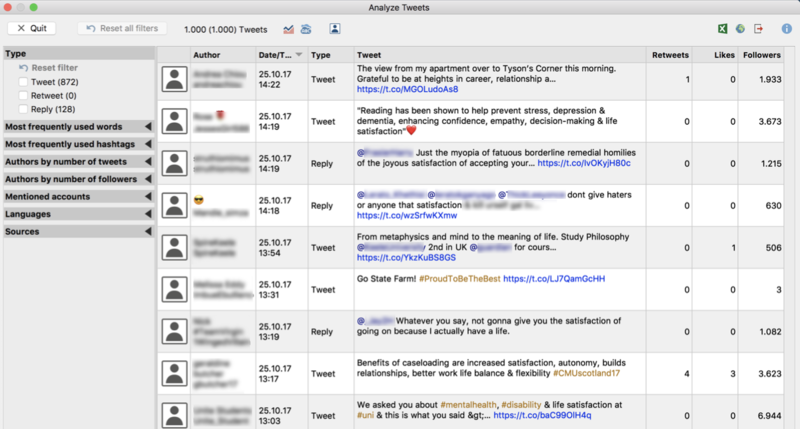 In the dialog window that appears select all twitter documents that you would like to include in your analysis. All analyzed tweets are listed in descending order by release date. The first column contains the profile picture, the second the Twitter name and real name of the author. When you start your analysis, no profile pictures will be displayed – you can display them via the Profile pictures icon. The pictures are loadedd and gradually displayed. If an image has already been loaded for an author, it will be used; there will be no update. Some authors have not posted an image on Twitter, for the column “Type” indicates whether it is a tweet, a retweet or an reply. In the tweets, hashtags and mentioned Twitter accounts are highlighted in color. Click a link to view it in your computer’s internet browser. Retweets – how often the tweet has been retweeted. This number is an indicator of the tweet’s popularity. Likes – the number of likes a Tweet received. Followers – how many followers the author had at the time they published the tweet. This number is an indicator of the author’s popularity. Tip: This table can be arranged by clicking on each respective column’s header. Using the filter panel on the left, you can filter the tweets according to several criteria. You can also expand and collapse the filter area by clicking on the filter header. The number in brackets behind the filter always refers to the total number of all analyzed tweets on the basis of that filter. This means that it will remain constant, even if you turn on several filters. The current number of listed tweets is displayed at the top of the icon toolbar. Please note: Within a filter range, an OR function is applied: If you set a “Tweet” and “Retweet” in the “Type” area, both tweets and retweets are displayed. The individual filter areas are connected with AND: If you put a check mark in the “Retweet” area and a check mark in the area “Most frequently used hashtags” for “#Berlin”, only retweets with the hashtag #Berlin will be listed. Types – always contains the three filter options “Tweet”, “Retweet” and “Reply”. Most frequently used words – Lists the most common words in descending order. Internet links and mentioned accounts will be ignored. All the words currently contained in the stop list for the word cloud will also be filtered out. Most frequently used hashtagss – lists the most common hashtags in descending order. Authors by number of tweets – lists the most active authors in descending order. Only the analyzed tweets are considered. Authors by number of followers – lists the authors with the largest reach in descending order. Their number of followers is used as an indicator of reach. Mentioned accounts – lists the most frequently mentioned accounts in descending order. Languages – lists the most frequently used languages in descending order. (The language is identified by Twitter automatically). Sources – lists the most frequently used devices and programs from which the tweets were sent in descending order. If needed, filter tweets according to selected criteria. To make your word cloud display only the most relevant words, you can transfer less important words into a stop list to exclude them. The easiest way to do this is to click on the button on the Word frequencies button at the bottom of the window to display the list of all the words that appear. The word frequency list is sorted in descending order. To transfer a word to the stop list, double-click the green icon in the first column. The green icon then changes to a stop symbol. Alternatively, select one or more lines with the mouse, and then click the Add to stop list symbol in the toolbar. Click the circular arrow in the toolbar to Refresh and apply stop list. The word cloud and word frequency list will then be regenerated, taking into account your new stop list. 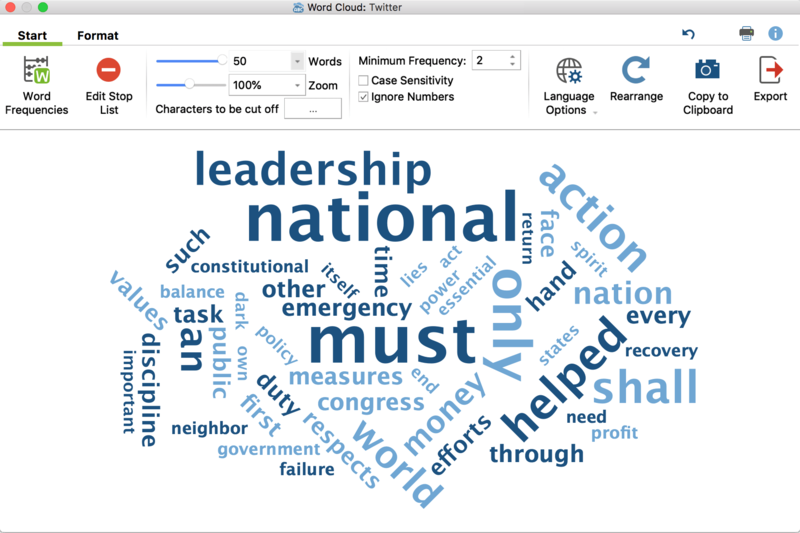 The filters for the tweets allow you to create and compare word clouds between different groups of authors. 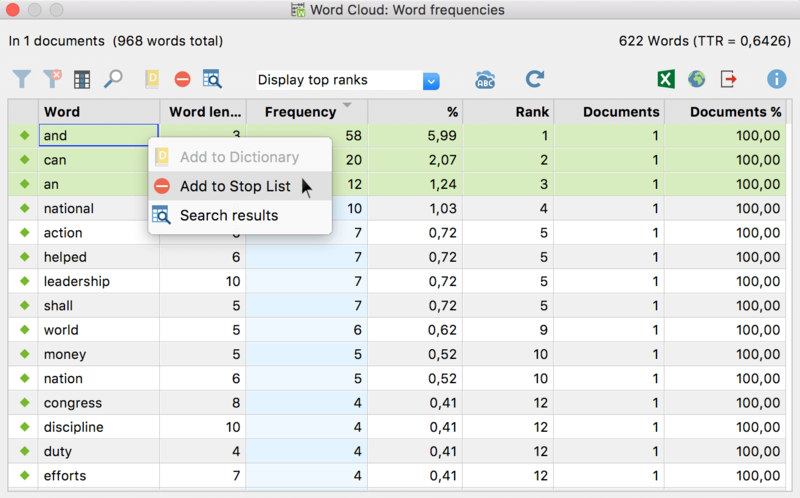 Tip: In MAXDictio, the add-on module for word-based analysis, you can manage various stop lists and always transfer these words to your “stop list for word clouds”. Filter your tweets according to specified criteria. Click the chart icon in the top toolbar to request a frequency analysis. You can use the arrows at the top of the window to toggle between individual frequency tables. Most frequent words Number of tweets 15 most frequently used words (options for making this anaylsis case-sensitive and/or taking word cloud stop-lists into account). The category “Other” can also be displayed. Most frequent hashtags Number of tweets 15 most used hash tags. The category “Other” can also be displayed. Author by number of tweets (real name) / Author bz number of tweets (Twitter name) Number of tweets 15 authors with the highest amount of tweets. The category “Other” can also be displayed. Authors followers Number of followers 15 authors with the most followers. The category “Other” can also be displayed. Source Number of tweets 15 most common sources. The category “Other” can also be displayed. Your results can be exported using the usual icons at the top right of the window. These functions always export the entire table. Export – MAXQDA creates a table as an Excel file (XLS / X format), as a web page (HTML format) or as a text document (RTF format) after you have entered a filename and location. The exported file is opened immediately.